Newly constructed house, at the exit of the village direction Puyvalador. level 1: day room with kitchen, opening onto a terrace (garden furniture), toilet. 2nd level: 2 bedrooms each with 1 double bed, 1 bedroom (2 single beds), shower-room (toilet). Ground floor: garage. parking on the spot. Small field at the 1st level on the north side. 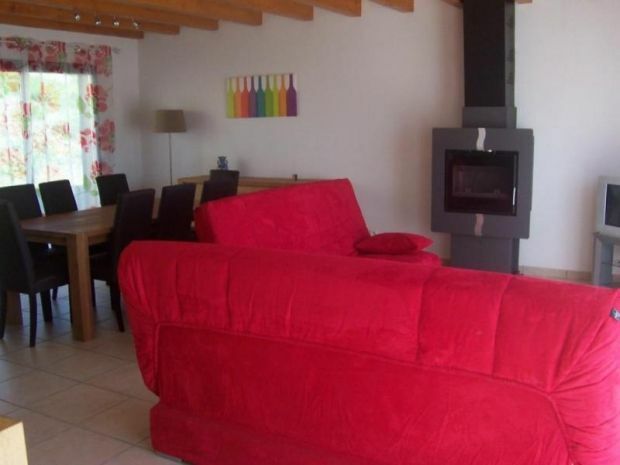 Lava-Lin, TV, Fireplace, Terrasse, Jardin, Garage, Animaux acceptés, Matériel bébé, Micro-ondes, Sèche linge, Lave vaisselle, Congélateur, Barbecue. Option à régler sur site : SUPPLEMENT ANIMAL (€/JOUR): : 15 €. OPTION FOURNITURE DRAPS DE LIT (€/LIT): : 6 €. OPTION SERVICE DE MENAGE EN FIN DE SEJOUR (€): : 70 €. OPTION LINGE DE TOILETTE (€/PERS. ): : 5 €. OPTION BOIS DE CHAUFFAGE POUR CHEMINEE (€): : 5 €.